Amazon makes it easy for Kindle users to download their notes and highlights, but we can't say the same for Kobo, which obscures a user's notes in a database file. Fortunately, there's a solution. I've just read on MobileRead about a new site called KoboNotes.com which can extract the notes on your Kobo ereader and present them in a usable form. 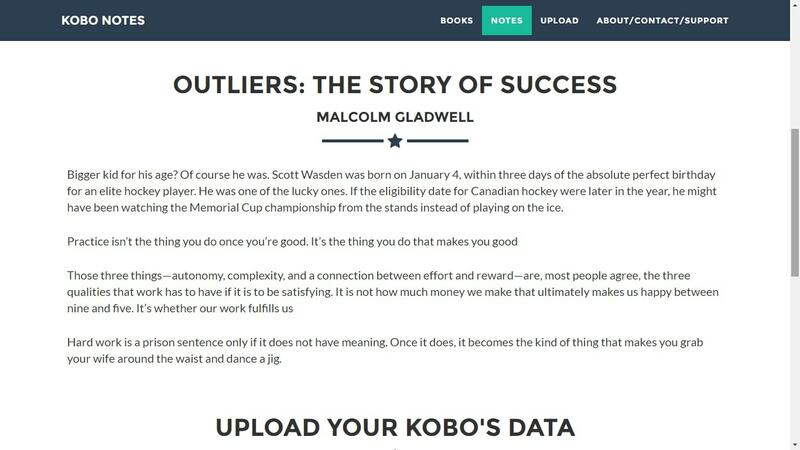 You'll need to set up an account, and then upload the "KoboReader.sqlite" file from your Kobo ereader, and once you do you will be able to sort the notes by the book they cam from. KoboNotes.com is, to the best of my knowledge, the only tool which lets you extract note from a Kobo ereader (I can't find a way to do this with calibre, in case you were wondering). Really? You want me to load a file that has a list of every book I have on the device to your web site? And includes the key information that Kobo uses to validate my device every time it calls home? Sorry, as useful as this might be, it's not going to happen. They're right; this is a sound reason to avoid using the site if you read sensitive documents or have concerns about your security or privacy. Why uploading the file to a website? If its sqlite, then you should be able to work on it using sqlite. Sqlite ist part of almost every Linux distribution and its also available for Windows. So as long as the notes are not encrypted it should’t be a problem to do what the web site does on your own PC. I checked, and the plugin descriptions didn’t say that this was an option. 1) Some solutions out there require computer skills in order to extract your notes from your Kobo eReader. 2) Most of these tools organize your notes in a strange order. KoboNotes organize your highlights and annotations by date of creation (which, in most cases, it’s also the order of that note in the book). 3) With KoboNotes you can read your notes anywhere and from any device. Just a side note: annotations are displayed differently on the notes section. Just so happens that the book “Outliers” does not have any annotation. If you select the book “The Monk Who Sold is Ferrari” you will see some annotations in the beginning, next to the highlighted text which it belongs to (these annotations are in portuguese, sorry!, this is my personal data). I think you’ve put together a great service. It’s too bad Kobo doesn’t offer something like this themselves. * Don’t presume users will know how to find and access the .kobo folder. For one thing, it will be hidden on some operating systems since the name starts with a dot. A simple how-to guide might be helpful for some. * Since you have date of creation info, it’d be nice to be able to sort the list of book titles by most recently highlighted. Also, for someone with a lot of books, a plain list of links might be easier to deal with than a dropdown menu. Hi Michael, I recently created a Q&A page to try to answer all the doubts about KoboNotes (http://www.kobonotes.com/qa.php). I’m a little sad that people think that this is malware. I provide my contact information (email, facebook and linkedin) in KoboNotes, so feel free to ask me anything you want about the website. came across this link when searching for a way to be able to view Kobo notes / annotations online. Unfortunately it appears Francisco’s site is no longer up, but thanks for all the pointers. I was able to re-use the python code referenced on the mobilereader site to set it up as a django website on heroku for personal use.